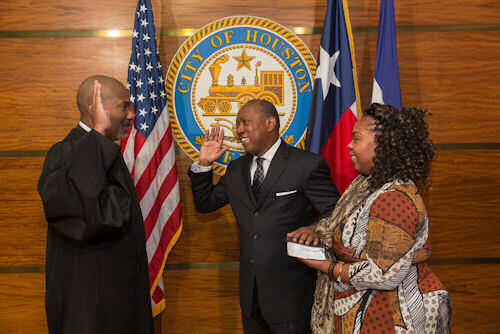 January 2, 2016 -- With his daughter at his side and his hand on a well-worn Bible that he used during his time in the Texas Legislature, Sylvester Turner was sworn in as Houston’s 62nd Mayor in a private ceremony held at Houston City Hall today. U.S. District Judge Al Bennett administered the oath to Mayor Turner and City Controller Chris Brown. A small gathering of family and friends was present.